The cruise itinerary will depend on the boat you choose and the dates available, this is an example itinerary. …It lies in the shadow of the towering 6,438m high Mt. Illimani, always snow-covered and visible from many parts of the city. The city (from the main square) is 3,636 meters above sea level but the neighboring city of El Alto where La Paz International Airport is located lies at over 4,000 meters. Some of the highlights of La Paz itself include Plaza Murillo, San Francisco Church and the “Witches Market” where vendors sell dried llama fetuses and frogs, dried llama dung, herbs, remedies and other ingredients used in Aymara traditions and rituals. …Pachamama (Mother Earth). Next, we visit the colonial section of the city where you will see the San Francisco Church, Gold Museum and Murillo Square. You will also visit the “Mirador de Killi Killi” viewpoint and the outdoor replica of Tiwanaku Temple. The tour then passes through the modern, affluent residential area of the city and heads out to visit the Valley of the Moon, where a clay mountain has been impressively shaped by erosion resulting in a formation that resembles the face of the moon. At the end of the tour you will be returned to your hotel. …town on the shores of Lake Titicaca. Nestled between two hills at 3,880 meters above sea level, some believe that the name Copacabana is derived from the Aymara “kota kawana”, meaning “view of the lake”. The crystal-clear waters surrounded by white capped mountains provide an extraordinary setting. Copacabana is famous for its large 16th century cathedral, a dazzling white Moorish-style cathedral with domes and colorful ceramic tiles that dominates the tiny town. The church houses the famous “Virgen Morena”. We stroll around the town and visit the church before taking a motorized boat to the legendary Island of the Sun (1 hour). We head to Huacani to have an Aptapi (typical highland lunch). We then continue by boat to the ruins of Pilkokaina Inca Temple. Finally, we hike for an hour to La Estancia, with wonderful views of Lake Titicaca. Dinner is included tonight. …boat for 1 hour to visit Chincana ruins and the Sacred Rock. We continue by boat for an hour to the Island of the Moon. Here we visit the ruins of Iñak Uyu Inca temple, returning by boat to Copacabana (1 ½ hours). Lunch is included at a local restaurant. From Copacabana, you will be taken by private transport to La Paz (3 ½ hours). …is the constitutional and official capital of Bolivia and it was here that independence was proclaimed in 1825. It is known as the “City of Four Names” as it is also called Charcas, La Plata and Chuquisaca. It is nicknamed “La Ciudad Blanca” (The White City) due to its many white-washed colonial style houses and structures. 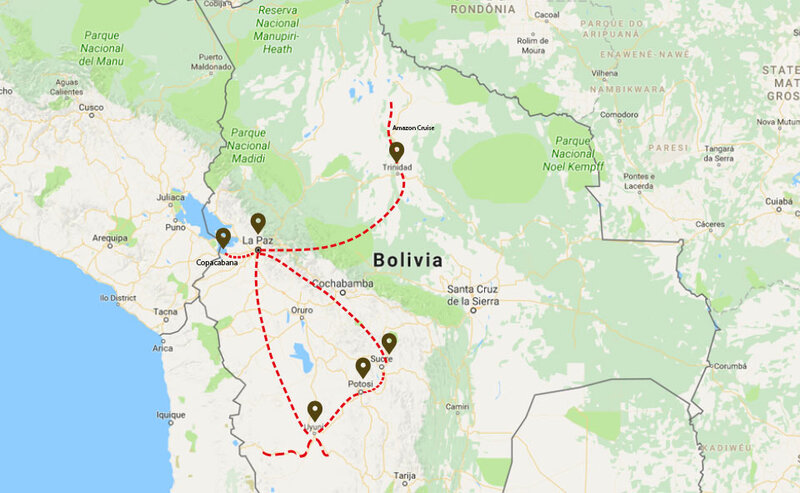 Founded in the 16th century by Spanish colonials, the city lies in southern central Bolivia at an elevation of 2,810 meters, giving it a cool, temperate year-round climate. The city preserves a wealth of colonial architecture and was declared a UNESCO World Heritage Site in 1991. The half day city tour introduces you to the charming colonial city of Sucre. The tour includes a visit to the Casa de la Libertad, where the Act of Independence of Bolivia was signed in 1825. You will also visit Bolivar Park, to see examples of the aristocratic tradition in Sucre with small replicas of the Eiffel Tower and the Arc de Triumph of Paris. Also included is a visit to the church and museum of La Recoleta and the Museum of Indian Textiles (ASUR). …culture. We will see the native houses, burial and ceremonial buildings and we will also go to a “chichería” (local bar) and taste “chicha”, a fermented drink usually made from maize. We continue to the Native Sanctuary and visit the small museums and the pottery and textile workshops. In the afternoon after lunch, we visit the small school in the community with time to talk with the children studying there. (Note: This visit is possible Monday to Friday only) At the end of the tour you will return to your hotel in Sucre. …past the old bridge of Puente Arce and then climbs up into the highlands at over 4,000 meters to reach the famous colonial mining town of Potosi. Potosi lies at the foot of the 4,824m Cerro de Potosi or Cerro Rico (“Rich Mountain”). It was founded in 1545 after the discovery of the rich silver deposits in the Cerro Rico that lured Spanish conquistadors here. It was the major supply of silver for Spain during the New World Spanish Empire and it soon became one of the largest and wealthiest cities in the Americas. Potosi is the world’s highest city, located at 4,090 meters above sea level. The city was declared a UNESCO World Heritage Site in 1987 for its architecture and colonial charm. The wealthy history of Potosi is still reflected in the narrow streets, colonial mansions and the many churches. It was for centuries the location of the Spanish colonial mint. This afternoon we take a half day city tour of Potosi, stepping back in time as we explore the old colonial streets. We visit the artisan market and the Casa de la Moneda (Royal Mint) where the wooden machinery used to make silver coins for Spain during colonial times can be seen. We see the San Francisco Church and the front of San Lorenzo Church that has one of the greatest examples of stone carvings of the baroque mestizo style. …and helmets are provided). Cerro Rico (Rich Mountain) was famous for providing vast quantities of silver to the Spanish and resulted in Potosi becoming one of the largest cities of the New World. Even though the mines have been depleted of silver, they are still mined to this day. Conditions for the workers are very poor and many of the miner’s contract silicosis caused by lack of protective equipment resulting in constant inhalation of dust. After the tour, we depart from Potosi by private vehicle to Uyuni. This amazing drive takes us through the Andes, through a colorful landscape with eroded rocks and giant cacti. We pass the villages of Chaquilla and Tika Tika and the famous Pulacayo tin mine. After 3 to 4 hours we reach Uyuni. Uyuni, founded in 1889 by Bolivian president Aniceto Arce, is still an important military base. It lies in south-western Bolivia, 3,670 meters above sea level and situated on the edge of the Salar de Uyuni, the largest salt flat in the world. The Salar de Uyuni covers over 10,000 square kilometers of the Bolivian Altiplano and is fringed by the mountains of the Andes. Beneath it lies the world’s largest lithium reserve estimated to be about 100 million tons and accounting for around 70% of the world’s lithium reserves. The salt in the salt flats is over 120 meters deep. The area is remote, arid and cold, stark, yet stunning, boasting extraordinary beauty and a silence that is captivating. Dinner is included at the hotel. …and the trains carried minerals to the Pacific Ocean ports. After the collapse of the mining industry in the 1940’s, many trains were abandoned outside Uyuni with the resulting Train Cemetery. The salt winds have led to the corrosion of the metal. We then set off across the Great Salt Flats to Colchani village, where we observe the methods of salt extraction and salt processing. We continue to Incahuasi Island (better known as Fish Island) – an oasis with a unique and isolated ecosystem that features algae and fossils. The area is covered with giant columnar cacti up to 10 meters high, some over 100 years old. Against the backdrop of the salt flats extending to the horizon, this landscape makes for spectacular photos. After a picnic lunch, we travel north to visit the pre- Colombian Pucara de Ayque fort and the nearby chullpares on the foothills of Thunupa volcano, before continuing to our hotel for the night, where dinner is included. …visit Hedionda Lagoon with its strong smell of Sulphur, Chiarkota Lagoon (a freshwater lagoon where diverse fauna can be seen) and Honda Lagoon. Situated in the middle of a low concentration salt flat field, its light blue waters contrast with the earthy colors of the highlands. We have a picnic lunch and travel through the Siloli Desert, one of the driest deserts in the world, with its bizarre rock formations caused by wind erosion. Dinner is included at the hotel tonight. …snow-capped peaks, thermal springs and geothermal geysers and is home to unique species of fauna that have adapted to the extreme conditions of the region. We visit Laguna Colorado (4,278 meters), declared a RAMSAR site due to the 30,000 Andean flamingos that nest here. Laguna Colorado is characterized by the red color of its water and it is the most important flamingo site in the region. You may also see vicuñas, llamas and vizcachas. We have a picnic lunch and continue to the Sol de Mañana geysers with their active fumaroles and volcanic craters. The crater bottoms display boiling lava and the fumaroles emit spouts of mixed water and superheated steam that reach heights of 80 to 100 meters. We visit “Laguna Verde”, a beautiful green lagoon at the foothills of the Licancahur volcano (5,865 meters), where flamingos are often seen, before continuing north to Uyuni. Dinner is included at the hotel. ..is the highest International airport in the world at 4,080 meters above sea level. …specified that basically the main activity of the Flotel is the Navigation, to this activity are added different activities according to the duration of the tour or the preferences of the tourist. Short sailing in a smaller boat in search of a good place to practice sport fishing: with chances to fish the ravenous red piranha and observe pink dolphins. At noon, we return to our main boat where we will start sailing north to find a good place to do sun and beach. Lunch at 1:00 a.m. enjoying the breeze of the river while sailing on the Mamoré River. After lunch, there will be a careful period of time for the passenger to digest the meal, since it will be transported to a beautiful beach where you can bathe and / or sunbathe on the famous deserted beaches of Beni. After the dinner will be the activity of the “Lagarteada”, which is nothing more than the simulation of hunting the black caiman. It is basically taught how to find the lizard or caiman and explains the characteristics of the same (at no time is touched or annoyed to any type of animal). …the eastern Bolivian, while riding in the middle of the open pampas of Beni. At the end of this activity, visit an indigenous community. Over here, learn the history of the ethnicity. In the afternoon, you will look for a good place to relax and enjoy some beach and with the possibility of observing pink dolphins or freshwater dolphins. …finding and visualizing some species of fauna that can be found in the jungle. After lunch, you will start your return trip to Puerto Los Puentes where you will be waiting for the taxi to take you to the Airport of Trinidad to take your flight to La Paz. You will be collected from your hotel at the appropriate time and transferred to the airport for your onward flight. Ascending to El Alto, there will be beautiful evening views of La Paz and the city lights, for those with evening departures. • Accommodation specified as per itinerary above. • Meals specified as per itinerary above. • Personal expenses and Tips.